Back in 1999 Paul was bored of working in the corporate world and one Saturday in June 1999, while drinking a glass of wine, he said out of the blue to Lynn “we must be able to do this” and that is how the whole adventure in English Wine started. Lynn was able to find the right land in the right location and in April 2001 we planted our first vines and harvested our first vintage in 2003. Since then, we have gone on to produce a range of award winning red, rosé, white and sparkling wines, together with cider and apple juice from our heritage orchard. We had no experience of farming or wine making and read a lot and asked many questions from fellow vineyards and also our vineyard consultant Hans Schliefer. 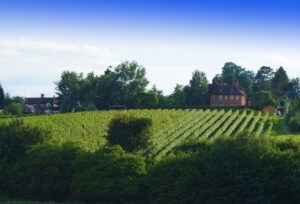 We also joined the United Kingdom Vineyards Association and the regional Wessex Vineyards Association. Paul has since joining served as a Regional Chairman and also as National Chairman from 2012 to 2015. Please do come and visit the vineyard and try our wines, we also have an online shop if that is easier.